Memorial Day is a time for us to get together with our family and usually spend some time outside. We usually have a family cookout and I’m always looking for new Memorial Day recipes to take along with us. A side dish or dessert is usually what J and I take along so I have been scouting out some great sweet treats for this year! But my sister-in-law is also a pro at making the dinner table look so festive. So this year, I wanted to find some great crafts that the kids could all do to help her decorate and to help make the party even more festive. I’ve gathered a small collection of some of my favorites to share! First up! The recipes! Because I love a good sweet treat after a tasty piece of barbecue chicken! And something to keep everyone busy on the long weekend and to help get decorated for your next gathering! How does your family celebrate Memorial Day? Do you have any Memorial Day recipes that are traditions? These are fantastic! Being in Canada, we don’t celebrate Memorial Day here but I sure know some people to pass this along to! These are all amazing craft ideas! 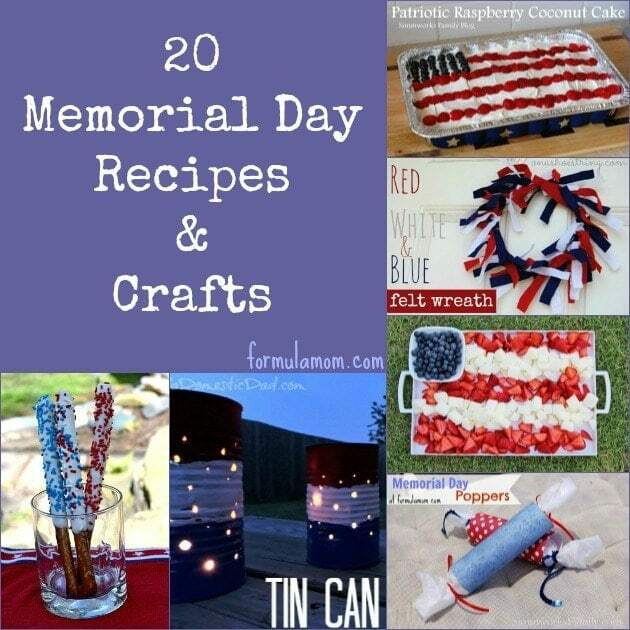 We don’t have Memorial Day in Canada but these crafts are gorgeous because you could easily adapt for Canada day or numerous other occasions. Great ideas. Thanks! Oh I love that fruit and cake platter! So cool! I can’t wait for Memorial day! It is always a favorite of ours! Awesome roundup! Looking forward to cooking out on Memorial Day! What great ideas to celebrate Memorial Day coming up, I think we will make the DIY poppers for sure. I love seeing ideas and posts from some of my favorite bloggers on this list! Great round up. Thanks for including my cupcakes! Looks like a great list! Great collection of links. I love the “fruit flag” looks beautiful and am sure it would be delicious. Awesome roundup! That Patriotic Raspberry Coconut Cake looks delicious!! These are some really great ideas. The cake looks delicious. The Red, White, & Blue Tin Can Luminaries would look awesome around my patio at night or on our picnic table. I love these. Very pretty!